“British Columbians deserve easy to understand financial reporting,with a clean opinion, from their government” ~ Auditor General John Doyle – Laila Yuile on politics & life in B.C. On November 6th, 2012, the Select Standing Committee on Public Accounts met to discuss the Audit Plan submitted by the office of the Auditor General, who as we now know, is the current target of dismissal by the BC Liberals. The questions and answers quite frankly, are quite onerous to read, but clearly, there are many on this committee who have issues with both his offices direct oversight and his offices intention to rectify how the government reports its financials. Of note is the fact that Doyle wanted to continue direct oversight over the Legislative Assembly Management Committee… the same committee who issued an ad looking for a new auditor general… and continued direct oversight over Transportation Investment Corporation, the crown corp overseeing the Port Mann Bridge/Hwy 1 project. The liberals did not enjoy his pointed references to their less than standard accounting…. again. 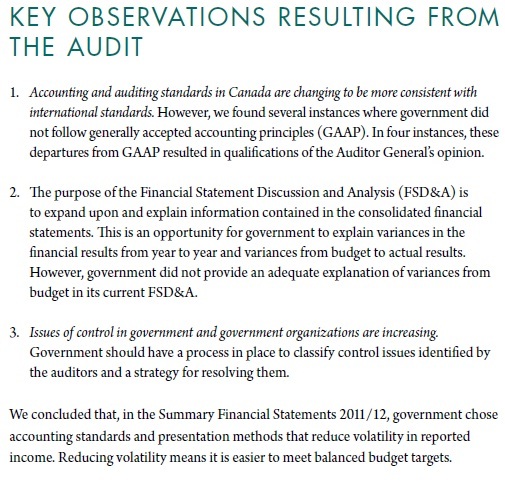 And at the Auditors proposed Audit plan for the coming years (pdf format)…..
And after years of Doyle telling the same sad story of how the Liberals have their own method of rigging the books to create an illusion that works best for them….. you tell me why the Liberals might not want him around any more. ← The definition… of desperation. We cannot afford to lose Mr. Doyle. I am still shaking my head over the news that he will be replaced. What a travesty! It is a travesty.. obvious controlling factors don’t want loose lips informing the populace of their .. ahem.. nefarious financial indiscretions, especially when so much money and effort went into disguising and hiding it from the population in the first place. Can’t say I’m surprised.. except that it took them this long to do it. I applaud Mr. Doyle’s efforts, and while the powers that be can fire him and put in a puppet of their choice, the information and facts are out there.. the damage is done and the Lieberals or Cons.. they’re not going to win the fight as fact speaks louder than fiction and the word is spreading faster than they can counter-spin. Time to tear down this house of tyranny, Harper and Clark need to go yes.. but so does the whole system that they used to establish themselves in the first place, the modified to fit the “party” and not the people, Canadian constitution. And the criminal law needs to be over-hauled as well. Mr. Doyle himself who will not take kindly to all the work done by his effort possibly being swept under the rug. I beleive since he let it known that he would like to extend his term that there will be explaining to be done, not only on whether their process was done correctly. he will undoubedly challange any discrepancies in the process and not be taken lightly in his mandate to finish his term. This could turn into a major mistake on government’s part if they try to remove him ,without cause, before his term. Don’t for one minute think that this will all go the liberal’s hope it will. I for one think they have made yet another whopper! We give far too much credit to these people as being capable. Why is it that every time little Gordy Campbell comes home to visit, not long after he leaves there is major upheaval/change of some kind in BC government? Not sure about that? Go back and take a look…and who would getting rid of John Doyle serve more than he? Really. Perhaps John’s insistence at getting at the truth of Basi/Virk is what really tipped the boat…especially if the courts had no reason to disallow his requests. Obviously, there is more than just worms in those cans that the libs don’t want opened. We can expect the coming election to be the filthiest ever seen on the liberal side – they will do Anything to keep the NDP out, especially if it means a full and open inquiry (with consequences) into the BC Rail affair – as well as other deals made by this liberal government. I just hope the documents are well taken care of and secure, because they won’t be if it appears the liberals are about to lose. Count on it. IMHO, the BC Liberals have just put another nail in their coffin. They foolishly think that they can get rid of John Doyle before he can finish his investigation into Railgate, among other things. Wrong! There’s an awful lot that can be accomplished between May 14 and October, when the BC Libs will no longer be able to put up any more roadblocks. This is going to be a very interesting year. I’m going to enjoy the ride! Anyone wants to bet the election gets pushed back till at least November…..odds? Already signed it. Hope everybody does. The rather devious Michael Smyth states in his column today that the “Auditor-general should be appointed , but ….”. He goes on to criticize John Doyle in at least 1/3 of this article. Firstly Smyth emphasizes as part of Doyle’s arrangement, he took four trips to Australia and this repayment was $65,588.19. Smyth also complains that he received $92,000 for unused vacation, spent significant funds at Victoria establishments, and at his annual salary of $333,000 he should pay for those perks. Without a doubt, John Doyle negotiated suitable arrangements for his employment and he needs to be reimbursed for those expenses. The other option would be to increase his salary to compensate for those so-called perceived extra charges. Maybe we can compare his compensation with the flagrant generosity granted to David Hahn for a much lower level of performance, and in addition how much did the latter bury his personal expenses in the corporate books. Smyth also conveniently ignores the hypocrisy that the Lieberals negotiated and signed this contract with him so who ultimately is to blame? And as you say far less generous than Hahn’s and others. Considering what Clark spends on Communications people, air fare, taxpayer paid credit cards, what Doyle charged is a drop in the bucket. And we still don’t know what the real financial picture is. We know it’s horrific, we just don’t know exactly.